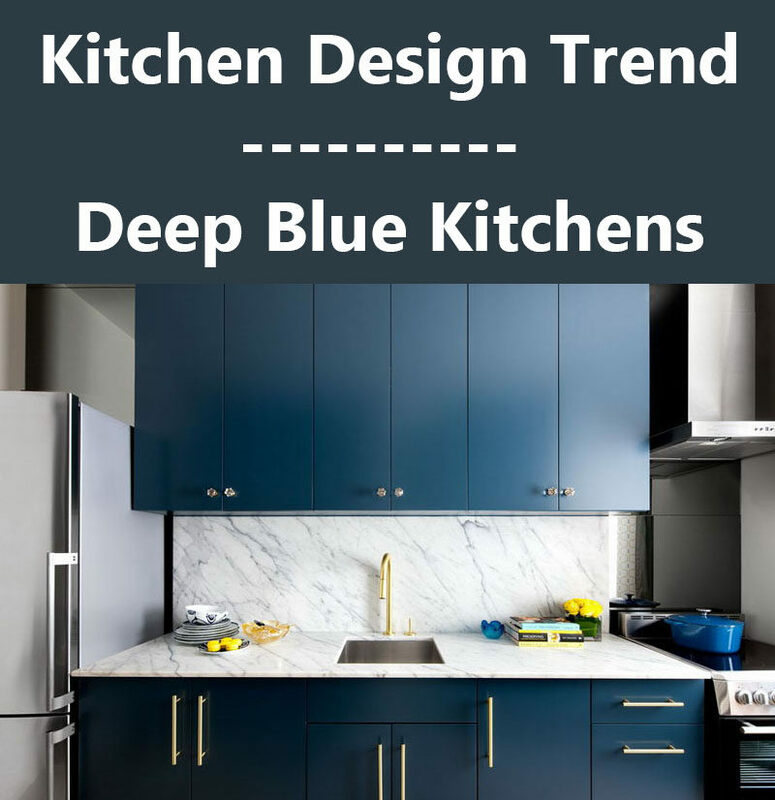 Blue kitchens are a design trend that’s been around for a while now but has recently become even more popular. Dark blue kitchens add color and personality to your home without coming off as silly or overwhelmingly bright. The deep color often pairs nicely with materials like gold, marble, and steel to create a kitchen that looks and feels elegant and modern. 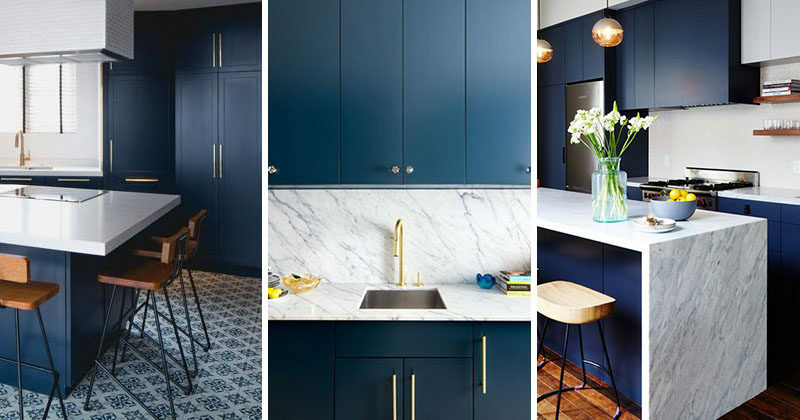 Here are some examples of dark blue kitchens that stand out from the rest and add a unique design detail to a home. 1. Dark blue cabinets with dark leather pulls and marble countertops give this kitchen a sophisticated Scandinavian feel. Inspiration from a house for sale through Entrance. 2. 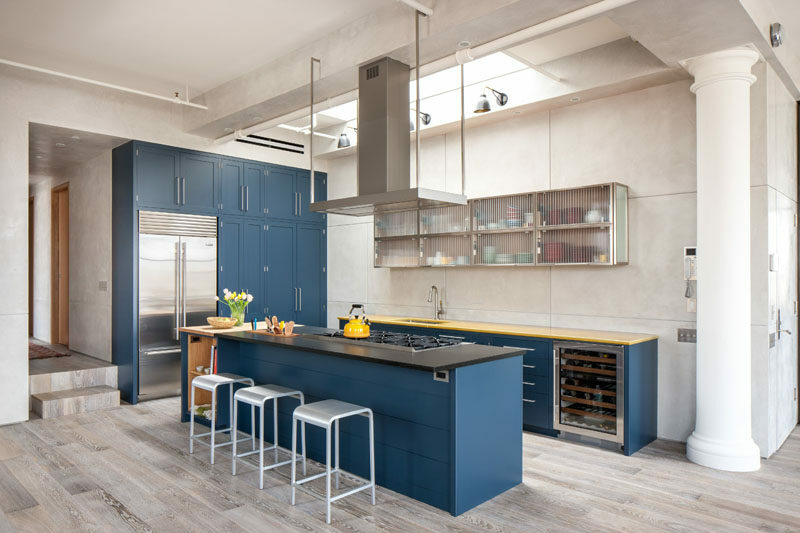 The blue cabinets are lightened up by the skylight above the kitchen and the neutral walls and light wood floors. Designed by Casamanara. Photography by Evan Joseph. 3. 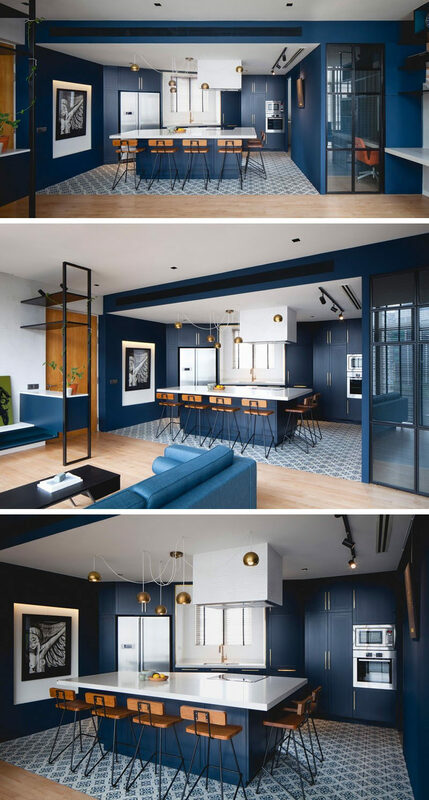 Velvety blue walls and cabinetry with gold features compliment the rest of the blue in the apartment and make the whole space look put together. See more photos of this home, here. Designed by Studio Wills + Architects. Photography by Beton Brut. 4. 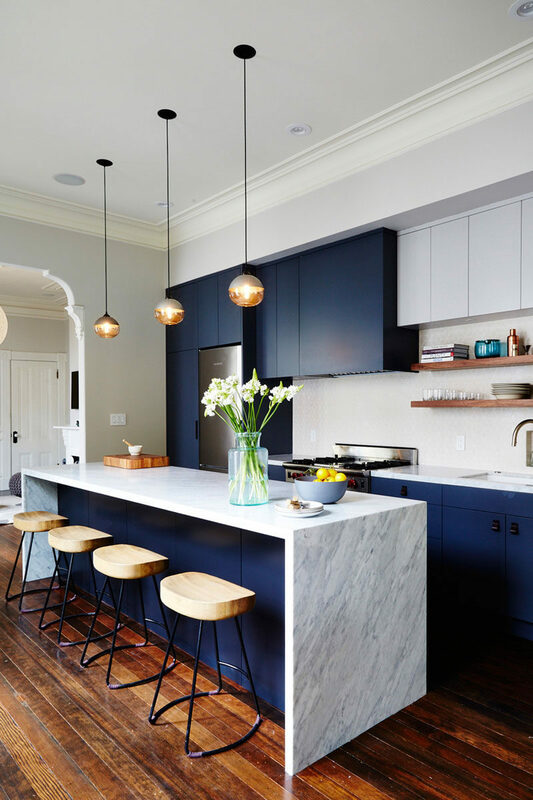 The elements of dark blue are brightened up with the light marble island and backsplash in this modern kitchen. Designed by Studio Muir. Photography by Nicole Franzen. 5. 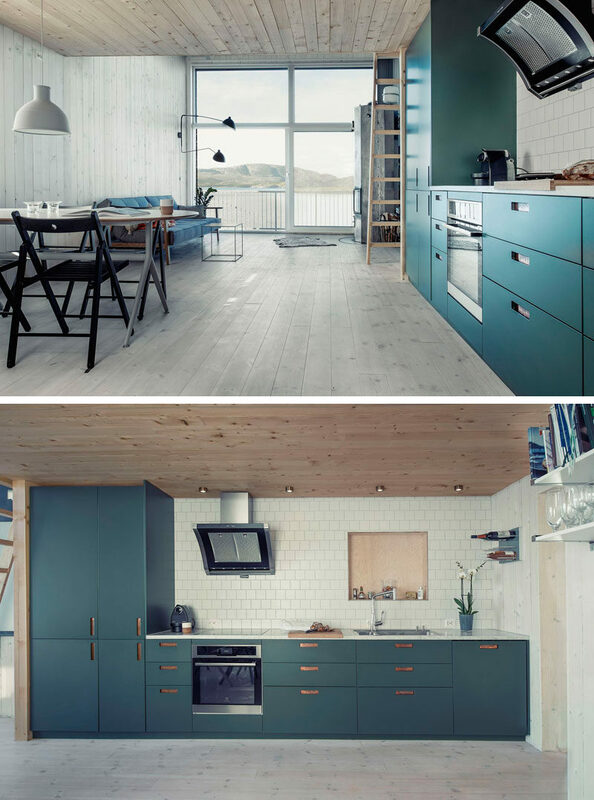 Dark teal cabinets bring color and fun into the light wood interior of this home. See more photos of this home, here. Designed by Asante Architecture & Design. Photography by Marius Rua. 6. 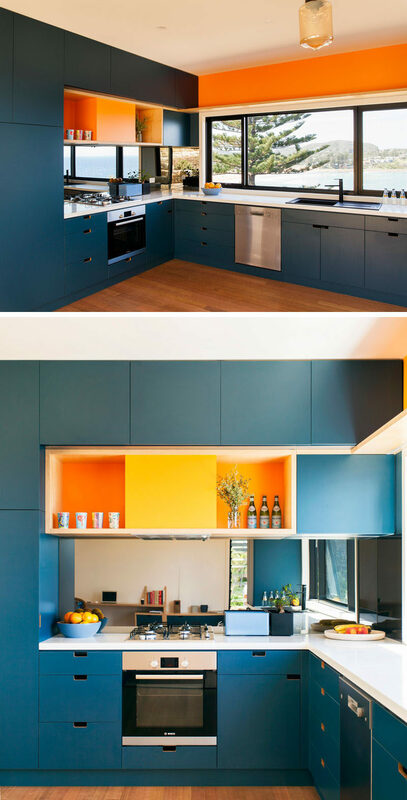 Orange and blue brighten up this kitchen and inject it with a touch of fun. See more photos of this home, here. Designed by ArchiBlox. Photography by Tom Ross. 7. 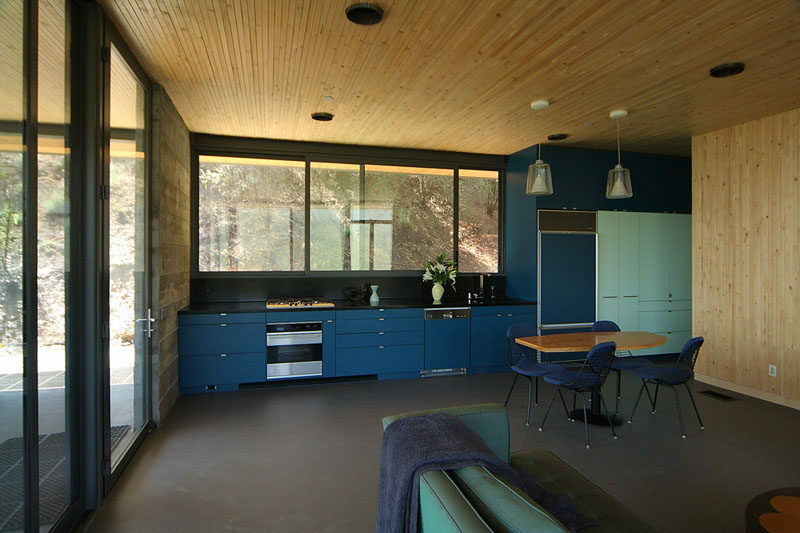 Dark and light blue cabinetry add a sophisticated element of fun to the wood and concrete interior of this home. See more photos of this home, here. Designed by Bruce Bolander. 8. 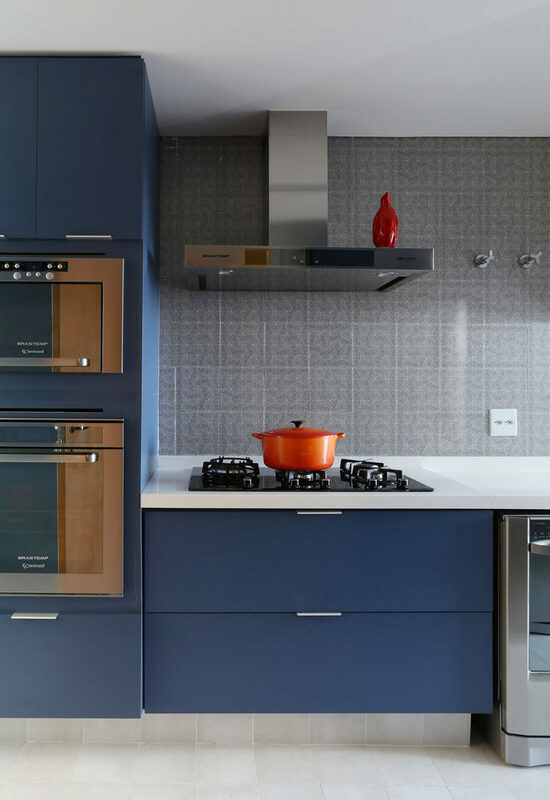 Matte blue cabinetry and stainless steel hardware and appliances give this kitchen a clean look and modern feel. Designed by Mandril Arquitetura + Interiores. 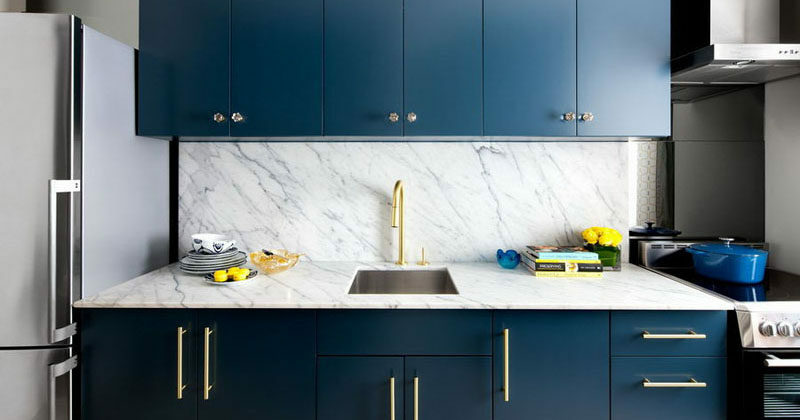 9.These blue cabinets with gold hardware make for unique and elegant cabinetry. Designed by Toronto Interior Design Group.